Royal Enfield, the global leader in mid-size motorcycle segment unveiled three of its latest custom build motorcycles developed for the very first time on its yet to be launched twin-cylinder platform, at the seventh edition of Wheels and Waves. Wheels and Waves is Europe’s landmark surfing and motorcycling festival, held every year in the city of Biarritz, France, bringing together the multifaceted world of motorcycles with surf & skate culture, through a philosophy of music and style in a vintage theme. The festival celebrates not only the machines, but the entire culture and lifestyle associated with riding and surfing. Wheels and Waves is one of the most anticipated events in the custom motorcycling scene. In its fourth year at the festiva, staying true to the spirit of the festival and illustrating its expression of ‘Pure Motorcycling’, that reflects through a rich custom culture, Royal Enfield unveiled three of its most anticipated custom renditions. The ‘Lock Stock’, ‘Rohini’, and ‘Interceptor’, have been developed on the recently introduced twin motorcycles – Interceptor INT 650 and the Continental GT 650, powered by Royal Enfield’s first modern day 650 twin engines. With their simple and uncomplicated design language, Royal Enfield motorcycles have become a medium of self-expression for riders and customizers worldwide, inspiring motorcycle sculptors to explore new frontiers of customization. Apart from the ‘Lock Stock’ a 865 cc drag bike – designed and developed by the brand itself, Royal Enfield has also collaborated for the first time with Young Guns Speed Shop, a custom house based in Switzerland and Old Empire Motorcycles based in UK, to work on two unique concepts with the Continental GT 650 and Interceptor 650 as base. The ‘Lock Stock’ celebrates the re-birth of the twins, in the form of a factory built speed-machine that brings out the true potential and capability of the all-new 650 Twin motor. 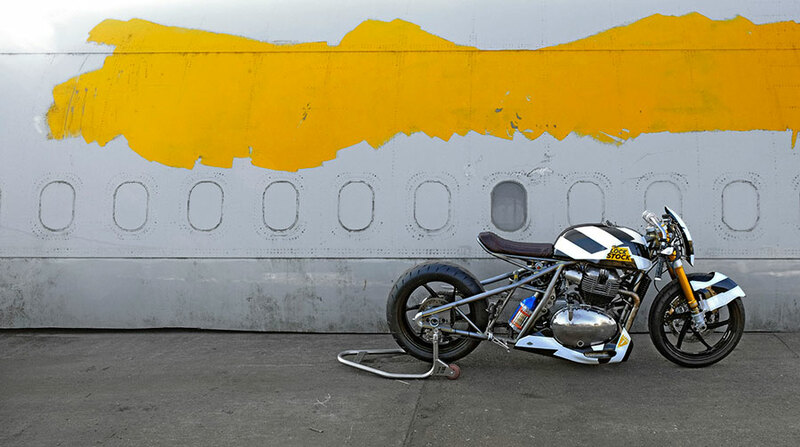 ‘Lock Stock’ is the first custom motorcycle by Royal Enfield in many years to have ‘two smoking barrels,’ designed and developed to explore the extreme possibilities of the new twin platform. The bespoke brazed steel drag racing frame has been made in partnership with legendary chassis masters – Harris Performance, blending old school beauty with performance capability and applying Harris’ skills to a completely new form of racing machine by them. The USA’s S&S Cycles, with their years of engine building experience, were brought in to unravel the true capability of the 650 motor, using it as a base and spinning it into a 865 cc engine with a nitrous injection. Its ‘Dazzle Camo’ paint job pokes fun at the tradition of motorcycle manufacturers camouflaging their prototypes. The minimalist carbon-fibre body and leather work reflect the individual passions and design sensibility of Royal Enfield designers, allowing them to demonstrate a totally different side of what a Royal Enfield can be. 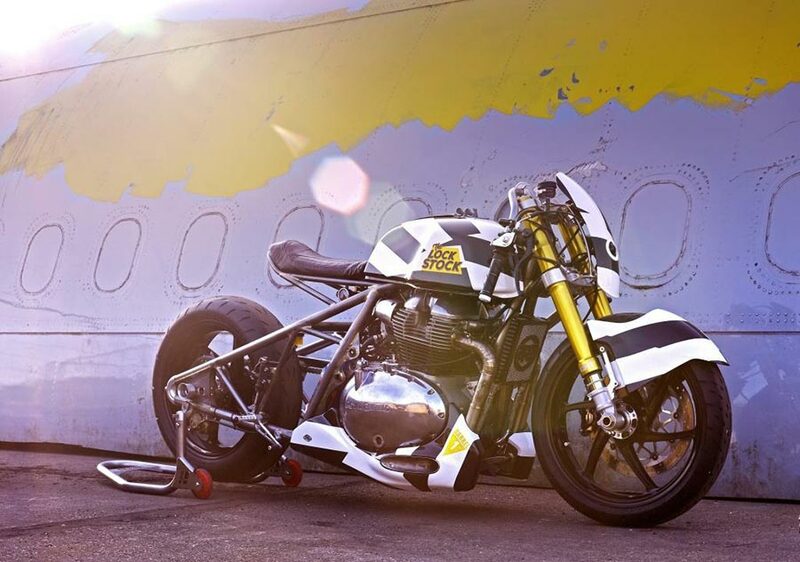 Young Guns Customs’ ‘Rohini’ was inspired by their interpretation of Royal Enfield, its existing brand image and, in a creative twist, an inspiration from India’s space program and it’s Rohini satellites. 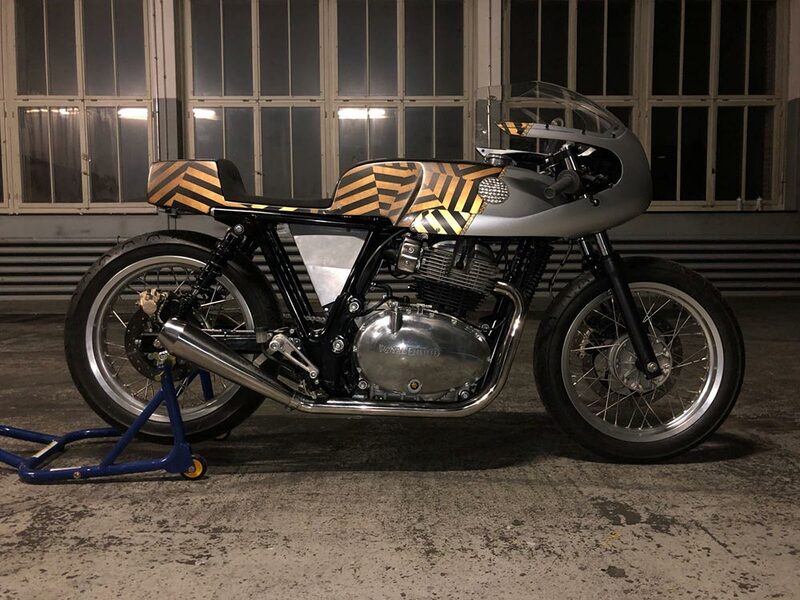 The build was conceptualised and designed to add a youthful desirability to the British nostalgia which already existed in the Continental GT 650. In the process, it was critical to preserve as much of the stock machine as possible, including a reference to the stock paint job, while amplifying it with a super slim and curvaceous fairing and monocoque seat/tail unit. 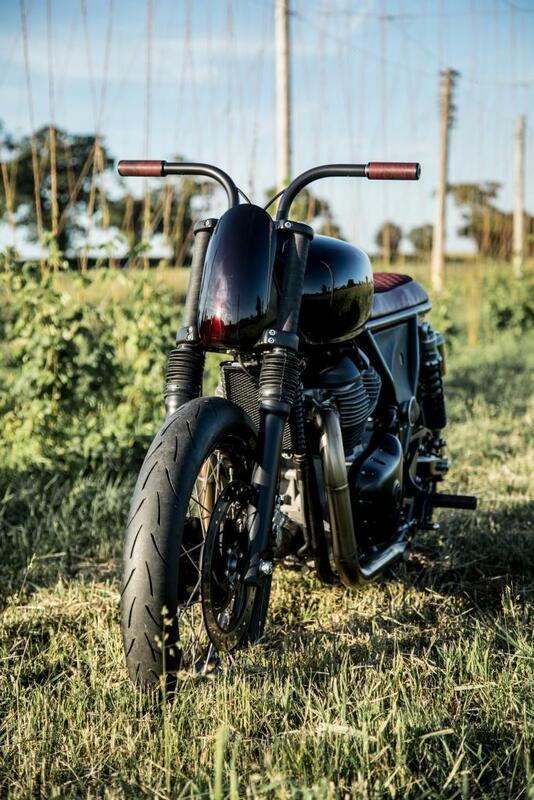 While the concept is pure cafe racer – referencing the iconic Rickman’s fairings – the build has a hidden surprise; in the dark, a layer of reflective paint transforms the classic lines into a riot of Razzle Dazzle light, blurring the lines between being beautifully retro and wildly modern – the consummate Cafe Racer meets satellite. Old Empire Motorcycles decided to strip the Interceptor 650 to its core – getting rid of everything that wasn’t completely necessary and hiding the essentials. A deep metallic red paint job matched to an Oxblood leather and Alcantara seat brings an elegant touch to the machine, with a balance of refined luxury and irreverent character. Its lowered stance and blacked motor hint at an aggression hiding under the refined exterior, while the cleverly integrated bars exemplify the old school customization ethos of removing anything that’s not strictly necessary, hiding all wires and cables with internalized controls. As an ode to the modern technology, the build no longer has a stock lock barrel and key, instead integrating a keyless ignition into matching riding gloves – another example of timeless style blending seamlessly with the modern world.